With sponsorship from the Swedish NGO Secretariat on Acid Rain, SENCO has developed a modelling and database system of 15000 Large Point Sources (LPS) of atmospheric pollutants. Methods for collating and estimating the emissions of SO2, NOx, particulate matter and CO2 have been developed. Data have been collated from a range of sources, including three global databases. These include power stations and other large combustion facilities. LPS emissions data for any country or region may be assembled. The system has been used to identify the largest emitters, and to study the effects of different emission control policies. These data may be used in other models; for example, the energy trading and energy models. The data system could be used in other applications such as assessing health impacts, the potential for CHP, emission trading, etc. For the Swedish NGO Secretariat on Acid Rain, SENCO has carried out studies of LPS in countries in Europe and bordering countries. The latest study was complete in October 2004 and may be downloaded here. 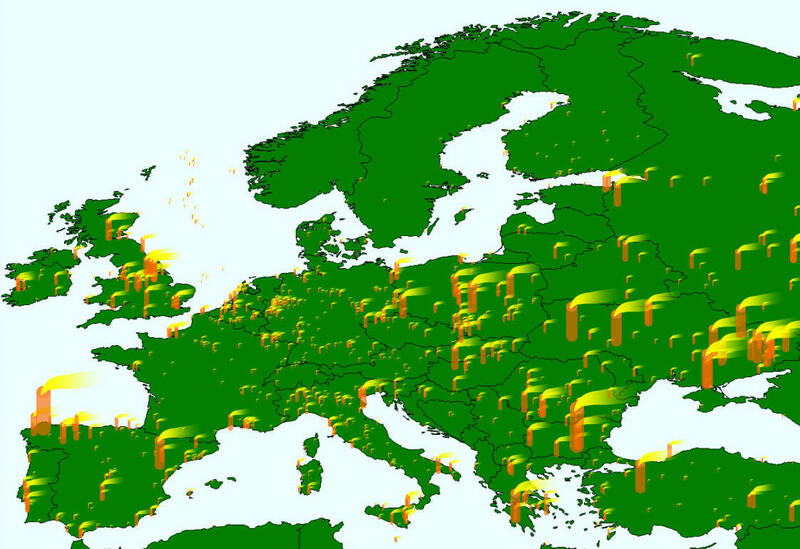 The map shows the 2000 largest point sources of SO2 in Europe. The chart shows the dominance of a small number of large sources for SO2 emission. The largest 200 LPS constitute about 73% of the emission from all LPS in the database.